"The Worshiping Bride" is a glimpse into that moment when the Bride of Christ begins to understand God's passion for her. 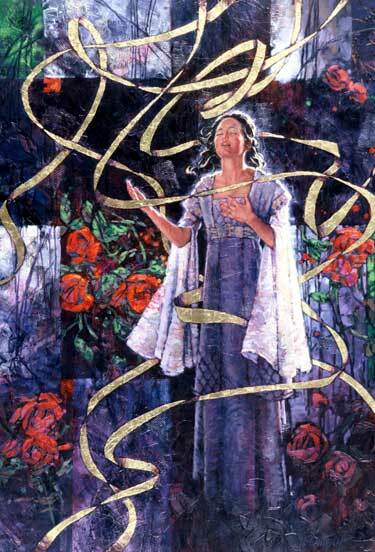 Symbolized by billowing golden ribbons, God's incredible love swirls above her (prefiguring a crown) and around her. Accustomed as she is to focusing on her own short comings, she is overwhelmed with the knowledge that Jesus, the Bridegroom God, loves her even in her immaturity. She responds in intimate worship, saying, "Lord, set Your seal upon my heart. Cause me to love you whole-heartedly!" Like the Shulamite in Song of Solomon, she declares with sincere abandonment that her garden is now His garden. Original, Oil on Canvas 48" x 36"